Over the past 10 years the number of quality sports horses, often imported from abroad has been on a constant rise in Thailand. There are now many stables as well as horse owners with expensive horses who compete in jumping, dressage, endurance and also polo. Many riders have trained abroad and the level of riding and horses has become more and more competitive with other countries. Until now there has been no education for horse grooms available and the demand for it has been growing in the past years. Most horse grooms start their work with zero know-how and follow “learning by doing methods” but often lack the appropriate knowledge to qualify as a horse groom. 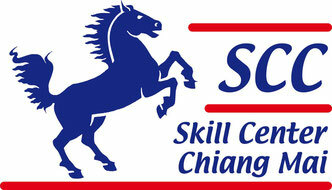 The university, had started a first project for horse grooms for some students from the Skill Center in April 2011. Three children from different projects had been chosen due to their interest in horses to participate in this pilot project. The University issues certificates for each accomplished course. Practical experiences are obtained in cooperation with several stables around Chiang Mai and also with Thai Polo Club in Pattaya. Since the first pilot project the interest for horse grooms has become much bigger than expected and another two courses were accomplished in April 2012. A Part of the Horse Groom Project is a dormitory that can house up to 20 students at a time. All students should remain under the support of the Horse Groom Project during their first year and a close supervision is possible while they practice their work in a stable outside of the project. During the yearlong education the teenagers learn to live independently taking responsibility for their own live. 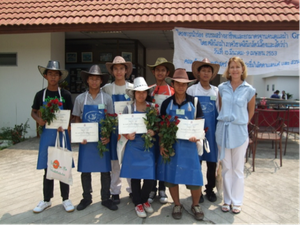 It is the aim to enable these underprivileged children to have a job possibility to support their family and receive a chance to break the cycle of poverty in Thailand. Hilltribe children still often lack any kind of ID cards and are therefore at risk of not finding employment. Unless the demand for their employment is so big that companies will hire them and help establish official ID card or sommething similar.